The day Jeff's been waiting for: we watch and then discuss the 1992 Godzilla vs. Mothra. 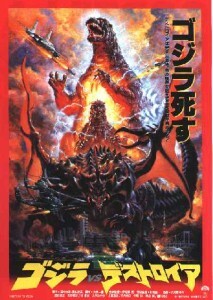 Greetings and salutations, Kaijucast fans and followers! Episode #46 is here and I’d like you all to prepare yourselves for a LOT of talking. “Why?” you might ask yourself. Because in this excursion into the land of giant rubber monsters, we take a look at the 1992 Toho tale known as Godzilla vs. Mothra. 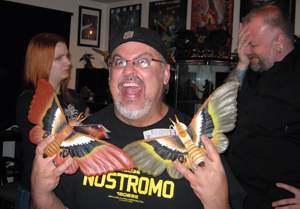 Jeff and Heather joined me in the Kaijucast HQ to experience the joy of Mothra. We also had a lot of listeners turn in their homework great job, class! In addition, we also have a few little bits of news and other tidbits to share pertaining to the average kaiju fan. We only spent a little bit of time discussing it in the episode, but the upcoming live show will be broadcast on Saturday, December 10th at 2pm (Pacific Standard Time). Check out the Live Show information page and keep an eye out for updates. Thanks to Things From Another World, Adam of the Monster Project and Chris Mowry from IDW Publishing for their awesome contributions to the contests! And special thanks to Old Town Computers for the assist with a temporary computer to help stream the show to the shoutcast host. I’m quite excited for our next movie in what I am sort of praising as one of the ultimate lineups (see the next few months’ discussion films to see what I’m talking about) is the 1995 Godzilla vs. Destoroyah. I’ve often mentioned that this film is my favorite of the Heisei era and I hope that if you haven’t seen it, you’ll track it down. I know that the movie is definitely available on Crackle.com right now. We’ll be watching the subtitled version, but watch whatever you can get your claws on because it’s definitely worth the watch. As with the rest of the heisei series, it has some goofy moments, but overall it’s a solid Godzilla film. That pretty much does it for us here at the Kaijucast until our awesome live show in December. Don’t forget to put that down on our calendars and to keep watching this website for more information as we get closer to throwing that switch!